What is integral theory in a nutshell? Integral theory is a framework for understanding life, the universe and everything, developed by Ken Wilber. 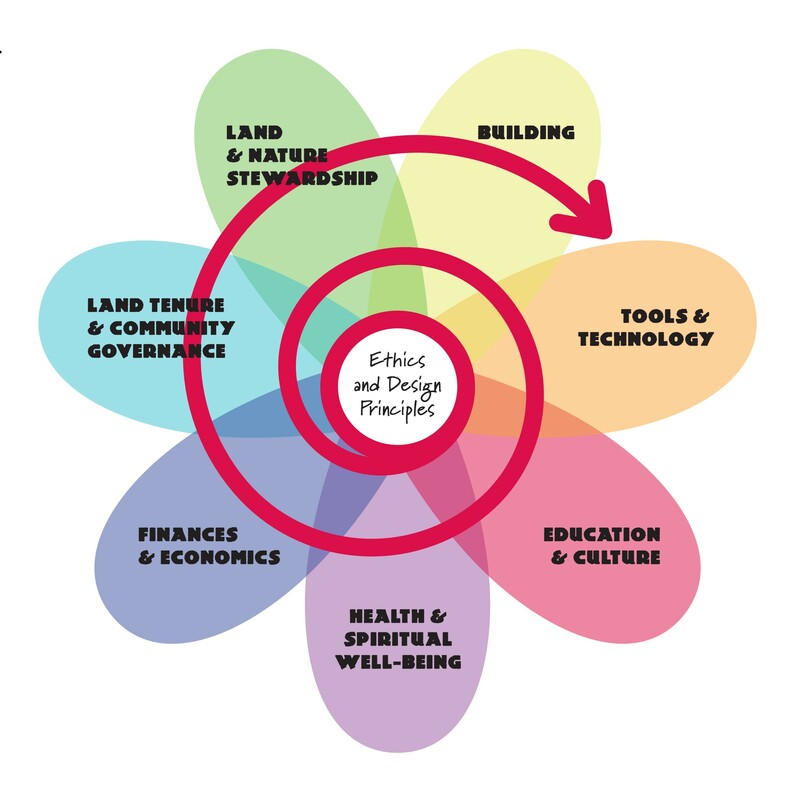 We think that integral theory provides an additional toolset that is useful in permaculture and want to develop and explore how it can enhance permaculture design. You can see our other posts on integral theory here. For a more in-depth explanation, here is Wikipedia’s article on integral theory. What is a holon in integral theory? A “holon,” a term coined by Ken Wilber, is a “whole part.” For example, we can describe an atom as a holon – a whole entity made up of smaller parts (protons, neutrons, and electrons). The atom itself can be part of a larger holon: a molecule (multiple atoms chained together to make a new entity). The molecule is a holon that can be part of a cell, which can be part of an organ, which can be part of a human being. Thus holons have a dual nature: they are complete, autonomous individuals, but they are also parts of other wholes. Holons form “holarchies,” where a whole is part of another whole, similar to a hierarchy but one in which the levels are concentric and build upon each other. We can determine whether anything can be considered a holon by looking at its prerequisites for existing. For instance, cells could not exist without the existence of molecules, and humans could not exist without cells. If any of the prerequisite holons is destroyed, all the other holons further up in the holarchy is also, by default, destroyed. However, if molecules were destroyed or could not exist, atoms (the lower, prerequisite holon for molecules) would still exist. How is the idea of holons useful for permaculture? Using the idea of holons to think about elements in a permaculture design allows us to organize our observations. Permaculture already has a similar concept — tessellation, meaning a whole created by one or more patterns — but holons allow us to hierarchically order elements and determine order of importance, causal relationships, and dependencies. For example, observing an especially green area on our land leads us to observe the dependencies of that green area: it is first dependent upon water that pools in the area, and the fact that water pools in that particular area is dependent upon the shape of the land. The image of a mountain is useful for thinking about holarchies, showing each holons’ dependence upon the holons preceding it. In this example, the earth is the base holon that holds up the rest of the mountain, with the human-created economy at the mountain’s peak. In between are the holons of climate, biosphere, human beings, and culture, each supporting the next level above it. All of these holons and the earth holon are prerequisites for the human economy to exist. Take any of the lower holons away or damage them enough, and the economy cannot maintain itself, and thus crumbles. The following image plainly shows that our current human society, in damaging the biosphere, climate and planet upon which it depends, is undermining its own existence. Another example is to compare the idea of having a single employer versus having a more diversified approach to making your living. In the former, in return for working at a job you are compensated with money so you can buy the things you need to live; the necessities of life are dependent upon the job, and losing that job leaves you unable to provide for yourself. With a more diversified approach you could directly provide some of the things you need to live — like food, water, shelter, or sanitation — and develop multiple small income streams to supplement this livelihood. Anything that you could not directly provide for yourself could still be bought, but the loss of any one element or income stream would leave the rest intact, leaving you more resilient and requiring less energy to return daily life to normal. In reality, having a job is dependent on living, but when we perceive that our livelihood is dependent on a single job and let that job be our only means of providing for ourselves, we are perceiving the importance of holons out of order. Applying the concept of the holon helps us to realize this distorted perception and to see that our priorities are upside-down, leaving our lives vulnerable to disruption — and helps us to see how we can fix that problem. Correct our perception, identify our priorities. The concept of the holon can be useful to help determine the relative importance, causal relationships, and dependencies of any given element in our design, and of the design itself, which is of course a holon. Visualizing holarchies in a “mountain” shape can help us understand the state of our design, evaluate its logic, and see where we might be undercutting elements that hold up the rest of the system. Holons can help us to correct our perception of reality and see the way things actually exist and relate, and identify when our priorities are out of order. This post is just part one in a series on integral permaculture. You can follow our discoveries here. As we pursue our interests in permaculture, sometimes it feels like we’re out there all alone. If we take a broader view and look at the whole picture it’s easy to find people who, while they’re not doing the same things we are, are engaged in same process. Knowing how our work is related can enhance what we do. David Holmgren illustrated this beautifully in his Permaculture Flower design. Not only is it packed with information, but its arranged in a meaningful way. This one graphic goes a long way towards explaining the whole of permaculture. This and more are available on his website Permaculture Principals and everything there is worth investing time into. Posted byMilton November 29, 2010 January 28, 2014 Posted inBlog, ProjectsTags: Chicagoland Permaculture Guild, Permaculture Project, PermacultureDB, Projects, TRP1 Comment on Welcome!